If there are trends lately in the world of modern classical, surely one of them is "the old in the new." Anybody reading this blog regularly will note the releases that somehow have brought earlier styles into conjunction with new music. And I cover older styles, too, at any rate because they do not remain static in the performance arena and they are part of the rootedness of where we are today. So the release up for scrutiny happens to fit in with all this nicely, and yet is rather unusual in that it is something you don't see that much. 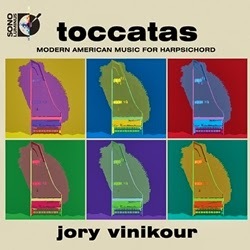 I refer to the recording of modern American harpsichord music as performed by Jory Vinikour (who also was on the Jose Lemos recording reviewed the other day) entitled Toccatas (Sono Luminus 92174). The works fill a rather wide period between 1953 and 2012. They all share in common a modernist harmonic-melodic sensibility along with a referential backward look at the music composed for the harpsichord in the instrument's heyday, namely the baroque. We have represented on this anthology well-known modernist composers who came into notice especially in the '50s and '60s or even earlier: Mel Powell, Samuel Adler, Henry Cowell; and then practitioners who are getting recognition now but perhaps are not as well known: Robert Muczynski, Thomas Benjamin, Robert Moevs, Stephen Blumberg, Patricia Morehead, Harold Meltzer. We get an hour of music that represents the musical outlook of today but respects the harpsichord toccata tradition with fugal, contrapuntal and rhythmic patterns that reflect the past, along with the sort of virtuoso, expressive, sometimes rubato, semi-improvised feelings one often gets in a traditional toccata from the earlier period. Jory Vinikour plays it all well, with sensitive attention to how the old and new conjoin in each case. As with many Sono Luminus releases this one comes with the standard stereo mix on a CD and a 5:1 surround sound mix on Blue-ray disk. The results are fascinating and endlessly listenable. This is unusual fare but it will bring to you music you will probably not hear otherwise, things to stimulate your auditory channels in the best way. And Jory Vinikour performs them all with real panache. Anyone who listens to music of almost any stripe today knows (if they have some historic breadth in their background) how radically transformed recorded music can be thanks to the digital platform. It has especially been a fortunate development in the "serious" electronic and electro-acoustic music genres. The technology behind the present-day creation, sampling and juxtaposition of sounds allows combinations that once were virtually impossible or so daunting that they were not often attempted on any complex level. Just because the means have become available in a more readily manipulated way, of course, does not mean that everything folks attempt is that much more advanced and intrinsically valuable from a musical point of view. But if the composer's imaginative, creative, whole-picture sense is vivid, the results can be pretty amazing. That is true of Noah Creshevsky, especially in his recently released opus, The Four Seasons (Tzadik 8097). Here we have a major full-lengthed electro-acoustic/electronic work that he conceived of as a sort of retrospective to what he's been doing from 1992 on. The idea is that through sampling and digital reconstruction of all manner of instruments and singers, in the most global sense, he can create a work of sometimes neo-orchestral density in music of a fascinating super-organic nature. This is music that sounds live but puts together contrasts and physically impossible playing situations. It's a music of a virtual large ensemble of supermen (and superwomen), doing things that no real-time situation could ever allow. In some ways there are roots in the electro-acoustic music of Frank Zappa and Pierre Boulez. Or to be more precise, The Four Seasons shares similar musical objectives/traits with some of the works of these forebears and brings things even further along. Hyper-complex counterpoint and an ultra-pointillistically utilized palette of diverse and radically conjoined note making or speech uttering (in the case of some of the vocal sounds)--all form the raw material for his ambitious compositional vision. Creshevsky often thinks in terms of style clusters, as with sections constructed of moments of what sound like traditional Japanese, klezmer or modern concert music, or for that matter, any combinations that suit him for that particular moment in the work. They are pieced together with considerable creative musical insight to meld an ultra-modern supermusic. It works because Creshevsky is the real musical deal, a visionary of the new possibilities in digital collage, if you will. 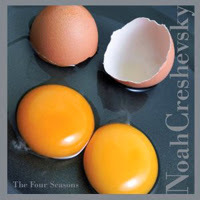 The Four Seasons is Creshevsky triumphant, one of the most captivating examples of electronic/electro-acoustic music you can hear today--exhilarating and absorbing, almost incredibly so. There are composers that begin a work or conceive of their music from a position of strength, with a clear feeling, a clear idea of what they want to do. Then they go about doing it from a special inner place. Other composers, other works are written from perhaps a more exploratory mind-set. 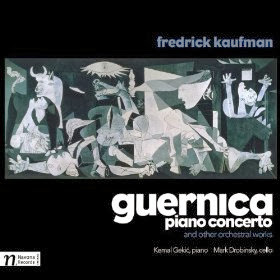 Fredrick Kaufman, in his Guernica Piano Concerto (Navona 5924) would seemed to have worked in the former state. It's a concerto based on Picasso's masterpiece, Guernica, a painting devoted to expressing strongly and poignantly the horrors of war, most expressly the horror of the Spanish Civil War, which took place between Franco's Fascist-supported troops and Spanish Loyalists in the '30s. Picasso created a painting that depicted a panorama of pain and suffering, a masterpiece of anti-war expression with few equals in the history of art. Fredrick Kaufman has created a nearly equally powerful work for piano and orchestra. The CD at hand today gives us this work in an excellent performance by the Czech National Symphony Orchestra, Marcello Rota conducting, Kemal Gekic playing the piano part. In is a three-movement work of great modernist power, strongly dissonant and dynamically forcefull at times, quietly despairing, mournful and in the end transcendent. It is a work all interested in modern large-scale classical music should certainly hear. This version seems sure to be the benchmark performance against which others will be compared and to which others must live up to. Harrowing yet very beautiful. On the disk is another seminal work by Kaufman, his "Kaddish" Concerto for Cello and String Orchestra, a work widely performed since its introduction into the repertoire, a kind of memento mori in memory of the composer's parents, at once both somber, kinetically eventful and expressively moving. The Czech Radio Symphony under Carlos Piantini, Mark Drobinsky, cellist, do this work full justice. Finally a more dream-like, natural sort of modernism prevails on the colorfully crafted Seascape. It gives us a refreshing contrast from the preceding works and shows another side of this important composer. The Czech Symphony Orchestra under Richard Hein bring out the salient qualities of the work quite nicely. In the end we have a most impressive three-work portrait of the composer. Works and performances are exceptional. This is one anyone interested in what is happening today cannot afford to miss. It is not music of compromise. It IS music of brilliance! The countertenor, the male voice so much a part of early music, if the singer is good, has a sound very otherworldly, uncanny. That is the case with Jose Lemos, and he shows this with great artistry on his collection of 17th Century Italian songs, Io Vidi in Terra (Sono Luminus 92172). He is accompanied by Jory Vinikour on harpsichord and/or Deborah Fox on the theorbo, a kind of lute of the era. The single-voiced song form was actually unusual before the 17th century Italian composers began excelling at it. The collection has some gems, by Monteverdi, Frescobaldi as well as lesser known (to us) composers such as Merula, Ferrari, Strozzi, etc. The combination of an exceptional countertenor in Lemos and the spirited accompaniment, with a few instrumental pieces scattered here and there to spell the songs, works remarkably well. Lemos has the embellishments, the delivery and the phrasing that works with the authentic period instrumental playing style to create a world that we no longer know in our contemporary world but recognize as fully worthy of our attention. Not since Alfred Deller have I heard a countertenor with this level of musicality and spirit. And the music is superb. I can't say that more emphatically--and I have nothing to gain by saying it except perhaps to convince others of what they will get with this release, to bring them the pleasure I experience myself by listening. By the way, as with many Sono Luminus releases this comes as a set: a CD with the stereo mixes and a Blue-ray disk with 5:1 surround sound. The Cold Blue series of CDs gives us access to many interesting works in an ambient, "radical tonality" soundscape zone. Today, one in their singles series, a 25-minute piece for three pianos by Kyle Gann. Long Night (Cold Blue 0019) features the totally appropriate playing of Sarah Cahill, who overdubs all three parts. The music is a slowly unfolding, minor diatonic sonic map. It is as if you are traversing a landscape dotted with multiple features, each feature a note series. The three piano interplay has a post Satie-esque gentleness. At first a very slow ostinato pattern underpins the diatonic melodic simultaneity and it reminds in some ways like the slowly random dripping of rain from a roof after a storm. The ostinato has slow tempo regularity and the melodic figures occurring on top are nicely random in terms of periodicity. The ostinato and its recurrence has a quasi-drone way about it that gives this music an almost Indian classical quality, like the slow alap section of a raga only less purposive. From the initial ostinato comes new figures that play against the raindrop melodics. But it all flows together as a processual experience with a singleness of musical personality. The sound is somehow like something out of nature, random seeming yet staying in the realm of the minor diatonic tonality consistently. Then, towards the middle, the key shifts and with it the melodic figures become more dense. It changes the music up nicely and allows our ears a refreshment that moves things forward. There may be others in the Cold Blue series that I would get first if I hadn't heard any of them yet. 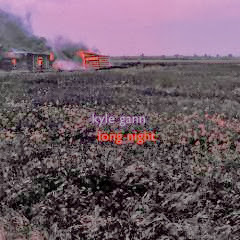 But in the end Kyle Gann's Long Night opens up an ambient world that one can inhabit frequently as a place to repose, perhaps meditate on life. Well done. A new voice in modern music can be an exciting thing, if the person has something to offer. That is the case with Laura Elise Schwendinger. Her recent album of chamber music, High Wire Acts (Centaur 3098), gives us a distinctive musical personality, in the modernist camp yet not predictably so. Five works are on the program, written between 1992-2006, each played by a different combination of instruments. 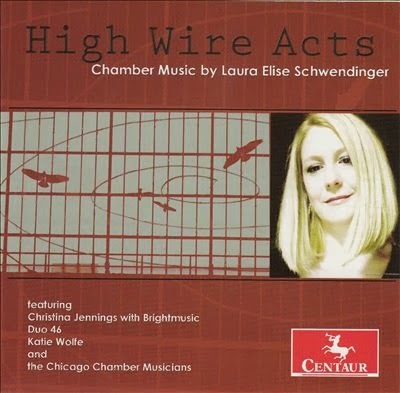 The first two are somewhat larger ensembles: "High Wire Act" is a quintet played very well by the ensemble BrightMusic. It's based on characters from Alexander Calder's wire figure assemblage Le Cirque Calder. Scored for flute, viola, violin, cello, and piano it is a piece of absorbing interest, concrete abstractions that include the wide intervalic leaps you would expect in serial/post-serial compositions, but also interesting group velocity interactions and other inventive figurations. The second, "Nonet" is another well constructed work in a similar vein, a hommage to Bach's Brandenburg Concertos and Stravinsky's Dumbarton Oaks, played with excellent musicianship by the Chicago Chamber Musicians. The remaining works are for duos and solo: "Rumor" for flute and cello, "Sonata for Solo Violin" and "Two Little Whos" for violin and guitar. The performers are sensitive and accomplished, well suited for the works at hand. They are Christina Jennings, flute, Greg Sauer, cello, Katie Wolfe, violin, and Duo 46, who are Beth Ilana Schneider-Gould on violin and Matt Gould on guitar. These more intimate works continue Schwendinger's abstract style in ways that ring with conviction and satisfy with abundant invention. Laura Elise Schwendinger brings us a cornucopia of musical riches on this program. Any connoisseur of modern chamber music would do well to hear it. Advent is that period in the Christian calender that anticipates the coming of Christmas, a period representing and meditating upon the coming of Jesus Christ. It is a period with a rich heritage of choral music written to be sung at this time. 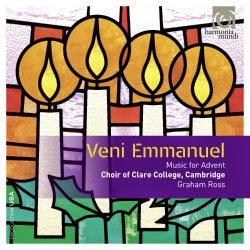 The Choir of Clare College, Cambridge, under Graham Ross has compiled a selection of works from the very ancient to the modern, written for the occasion, Veni Emmanuel (Harmonia Mundi 907579). The program is framed by perhaps the very most beautiful music of all of them, "Veni, veni Emmanuel (O come, O come Emmanuel)," given beautiful performances in arrangements for both the Latin and the English versions. And then there is the nearly equally moving "Es ist ein Ros entsprungen" by Praetorius. The collection has a little of everything great in this repertoire: plainchant, works by Byrd, Bach, Mendelssohn, Rachmaninov, and the present-day John Taverner. The Choir of Clare College sound exceptionally good, hauntingly so. Much of the music is a cappella. Nicolas Haigh accompanies the choir on organ for those that are not. Conductor Graham Ross deserves hardy congratulations (along with the Choir of course) for the wonderful high-precision and passion of the performances. The singers give their considerable all throughout. It's a program that helps you appreciate the long tradition of music for Advent. You feel the time passing in music, the mystery, the exultation. Veni Emmanuel fully enthralls. It is a hands-down winner. Kudos to Ross and the Choir of Clare College! The story of Erik Lotichius (1929- ) is at first a sad, but in the end a happy one. He wrote his first symphonic music when he neared the age of 30 and continued to compose throughout his life. But performances were not frequent for him, recordings even less so. His style, the closest lineage member perhaps being George Gershwin, was not in an avant realm and so he did not find himself in great demand. Fortunately Navona Records discovered him and agreed to record some of his music. By that time he was seriously ill. 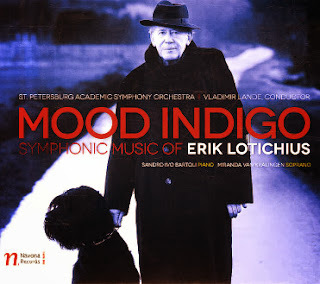 The works on CD and a DVD about Lotichius are available in the set Mood Indigo (Navona 5913). The St. Petersburg Academic Symphony Orchestra under conductor Vladimir Lande does full justice to the music, which for the CD consists of three multi-part works of some length and a short coda-like piece. They are "Variations and Finale on 'Mood Indigo'," "Concerto No 1 for Piano and Orchestra," "Four Songs on American Poetry," and the succinct "Ragtime for Orchestra," bringing us nearly an hour of prime Lotichius. The Variations are of course based on one of Duke Ellington's most famous melodies. The Piano Concerto follows in sequence. They are quite jazz flavored and well wrought. The jazz element is something akin, as I have alluded, to what George Gershwin favored and the era when he produced his most well-known symphonic works, though the composer also notes the influence of Dave Brubeck in the Concerto and yes, there is also some of that. The former of course does not mean Lotichius is a Gershwin ringer, far from it. He works his own style out beyond mere influence, coming up with original music that nonetheless bears the stamp of that time. Sandro Ivo Bartoli plays the piano solo part with grace and a dynamic flair. The Four Songs have a jazz-cabaret flavor. Miranda van Kralingen is the vocalist on these symphonic songs. She may not have been quite the best choice as there are vernacular elements with which she does not sound especially comfortable. Opera I am sure she does well, but alas not these songs. Nonetheless the music comes through fully in spite of it all and so nothing is lost, really. The Ragtime has spirit and a liveliness that marks a fitting close to this program of music. In the end it is a good thing to hear Maestro Lotichius's works and that's what it is all about, of course. He is a composer who deserves the attention he is finally getting, now that stylistically anything goes. This is music that should find a wide audience, music that charms and interests, comes though with a clarity that has as much musical logic to it as it does passion. Well worth hearing! 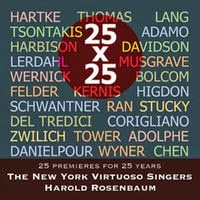 The New York Virtuoso Singers under Harold Rosenbaum had a great idea on how the celebrate their 25th anniversary as a performing group. They commissioned 25 composers to write a short choral work, then performed/recorded those works in two concert settings earlier this year. The resultant two-CD set is now available for us to hear, aptly titled 25 x 25: 25 Premieres for 25 Years (Soundbrush 1027). They chose their composers well. Each contributes a work of value and impact, covering the contemporary choral spectrum with a vast panorama of styles and moods. There are some names well-known to the modern music enthusiast; others are not as familiar, at least to me. But all have something worthy to say. Some of the better-known composers represented include David Del Tredici, John Harbison, Shulamit Ran, John Corigliano, Jennifer Higdon, Yehudi Wyner, William Bolcom, Thea Musgrave, Joseph Schwanter, David Lang, Joan Tower, Ellen Taaffe Zwilich, Roger Davidson, the list goes on. In the end we have a rich treasure of new choral works, beautifully performed. The experience of listening is a fundamental pleasure and a true voyage of discovery. With such a wealth of new music, it takes a bit of time to assimilate. But then all gradually comes alive for us. It is a true event, a milestone of what is happening now, 21st century choral music at its very best and in all its varied glory. Most of us know that the classical era per se, via the Mannheim School, did the most to establish the modern symphony orchestra and the symphony as a more or less standardized form, with a movement structure that carried through (with variations) at least through the initial romantic era and beyond. Josef Haydn did as much or more than anybody to leave us with a body of works (more than 100) of lasting excellence and paradigm-making importance in the classical-era symphonic realm. The Handel and Haydn Society go way back, having been founded in 1815. 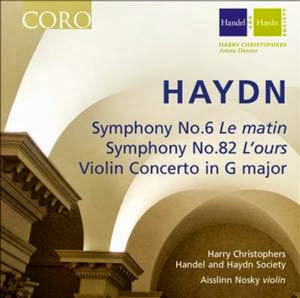 In the fifties of last century they did valuable work making some of the then lesser-known symphonies of Haydn available on LP in respectable versions. I still have a few from those days. They continue the good work today, sounding better than ever. The latest CD is a live recording of the orchestra conducted quite ably now by Harry Christophers in performances of Haydn's Symphony No. 6 "Le Matin", Symphony No. 82 "L'ours" and the Violin Concerto in G major (CORO 16113). These are versions that are more period-specific than the typical recordings made with larger orchestras in more-or-less Beethovenized performances, something one found a great deal of in my youthful LP days. It still can be the case but assuredly not with the Handel and Haydn Society, not here. But that is not to say the the music is then somehow less spectacular, exciting or moving. In Harry Christophers and the orchestra's hands they are beautifully lively, filled with momentum, transparent in the balance of parts, filled with life. Aisslinn Nosky steps forward from the orchestra for the Concerto (she is otherwise the concertmaster), and sounds very good indeed. All three works are classic Haydn. "Le Matin" has virtuoso part writing and an almost chamber intimacy. I have not heard a more idiomatic version. It convinces where some others sound tentative or even peremptory. This version is more playful and lilting than those I have known. "L'ours" is among the most popular of his pre-late period symphonies and justifiably so. The "dancing bear" movement is handled with just the right amount of spirit and humor by the orchestra; the rest of the movements sparkle with old-world folk qualities in Christopher's hands. Haydn both shines as a brilliant original but also reflects for us with the full man-of-his-times storytelling folk aspect of his music. The Violin Concerto comes off with authentic charm and brilliance as well. In short this is a marvelous volume of Haydn: three masterworks played in a manner that does perfect justice to the venerable master. He no doubt would have enjoyed the performances. There is no one way. There are many ways. If we didn't know that at some point in terms of modern concert music, we most certainly do now. 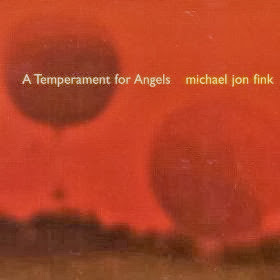 Michael Jon Fink gives us a way in his half-hour work for sustained strings/samplers, A Temperament for Angels (Cold Blue 0017). It's another evocative work in the realm of post-minimalism/radical tonality. Fink builds an ambient world of gradually evolving harmonic blocks, using multi-tracked violas, cellos, digital sampling (sounds like mainly of the strings) and mallet-sustained cymbals. It results in a soundscape that builds and shifts in harmonic content over time, then decrescendos in the end to poignant silence. It is of a piece with many of the Cold Blue single releases in its singular devotion to tonal atmospherics. And so it too has a definite appeal and impact on the listener in the way it constructs a slow moving, ever-changing, ever-present musical world of its very own. This may not be the first Cold Blue album to get. I reviewed some others over the last six months and one or two of those might best come first, but A Temperament for Angels has a Zen kind of focus on the nature of complex tone clusters that has genuine merit and holds up well after many listens. Nice! 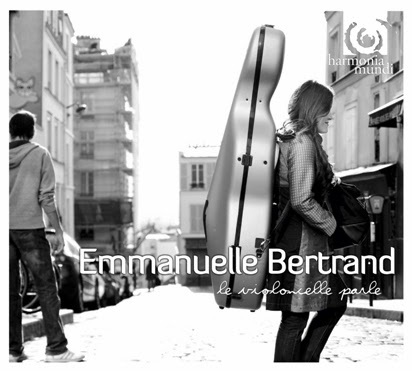 I have heard and been impressed with cellist Emmanuelle Bertrand on a number of recordings (and reviewed at least one on these pages). But it is only on hearing her unaccompanied solo CD le violoncelle parle (The Cello Speaks) (Harmonia Mundi 902078) that I realize the full extant of her artistry. The CD/DVD set was released several years ago (2011) but of course it is as relevant today as ever. The CD covers four works, Benjamin Britten's "Suite for Solo Violoncello no. 3 op. 87," Gaspar Cassado's "Suite for Solo Violoncello," Pascal Amoyel's "Itinerance," and Zoltan Kodaly's "Suite for Violoncello op. 8." The accompanying DVD has Ms. Bertrand in performance excerpts from the recording session, conducting a lesson and speaking to us on her playing, the works and what it all means to her. Her performances of the works are no less than superb. Her incredibly beautiful tone, especially in the lower register, her technical prowess, intelligent interpretive acumen, and her magnificent expressivity put her at the very top of the pack, a cellist for now and for the ages. Listen to the work by her pianist partner Pascal Amoyel. It is about those who suffered in Auschwitz. The Semitic dance passages and the part for singing voice and cello are absolutely haunting, supremely transcending and compassionate in Ms. Bertrand's hands. So too the Kodaly, an extraordinarily demanding work she plays with such artistry and skill that the work opened up for me as if for the first time. The DVD is moving, revelatory, a testament to her love for the instrument, for music, for the works she performs here. In every way this is a recital that stuns in its excellence. You must not miss it! When three works work so well together that their inclusion on a single album gives one a kind of encapsulation of a style-period, then that CD is worthwhile for that very reason, if not others as well. That's how I feel about the disk set Weill-Ibert-Berg (Sono Luminus 92161). As with many Sono Luminus releases, this one has a regular CD for two-channel mixes and a Blue-ray disk for the 5:1 versions. Each work is scored for chamber orchestra and soloists. Each is a gem of early modernism. They are Kurt Weill's "Concerto for Violin and Wind Orchestra, op. 12," Jacques Ibert's "Concerto for Cello and 10 Wind Instruments," and Alban Berg's "Chamber Concerto for Piano, Violin and 13 Wind Instruments." Timothy Muffitt conducts the Baton Rouge Symphony Chamber Players for these performances. The soloists are John Gilbert on the violin, Dmitri Shteinberg on piano, and George Work on cello. I'll admit I've heard more rousing versions of the Berg, though in some older recordings that may not even be available at this point. But on the whole these are well defined, well recorded versions of works that go together excellently. They each have an almost ecstatically liberated feeling to them, as composers of that era took advantage of the new modernist ethos and the increased expressive freedom. And the three composers were important practitioners in the new style. The Berg is a masterpiece, the Weill belongs in in its company and the Ibert is quite worthy as well. All keep each other's company like three old friends enjoying an evening together, so sympatico with one another that the conversation flows pointedly forward with a good deal of impactful content and real style and grace. The performances are spirited and well paced. There may be others available that have a slight edge, but the grouping together of the three on one disk makes for a most satisfying listen. I was unable to audition the 5:1 versions as I do not have Blue-ray capability, but I can well imagine that they add significantly to the aural staging of the music. In any event the stereo version has excellent sonics in itself. An anthology of contemporary works for cello makes sense on a number of levels. It helps unify what could be a very diverse selection with a solo voice that is consistent in range and attack, for one thing. Secondly, the cello has become central to modern music over the past century. It certainly is one of the defining sounds of our contemporary musical world. So it is quite appropriate that we have such an anthology. Third, if the cello soloist remains the same throughout, it then acts as a showcase for that artist. All these things are true of the CD Moto Perpetuo (Navona 5901). 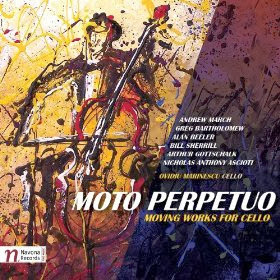 Ovidiu Marinescu tackles the cello part in each of the eight works (or suites of works) represented here, capturing with verve the variety of moods and styles represented. You may not be familiar with all the composers, but they do represent a cross-section of those writing interesting music today. There are works by Andrew March, Greg Bartholomew, Alan Beeler (with three works/suites), Bill Sherrill, Arthur Gottschalk, and Nicholas Anthony Ascioti. The works are in the chamber mode, ranging from pieces for solo cello, for cello and flute, cello and violin, as part of string quintet, for cello and piano, and as part of a piano-string trio--with piano and violin. Marinescu comes across with feeling and depth. The chamber music partners sound good. The music has depth and substance. And in the end, especially if you are a lover of the cello played well and expressively, you have a satisfying program of modern music you will not find anywhere else. 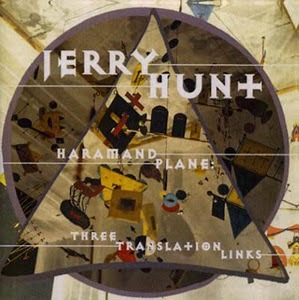 Jerry Hunt constructs involved electro-acoustic music assemblages that associate with visual complexes and are activated via the gestures of the composer-performer. That's as close to a nutshell description as I can get after reading the liner notes to the CD Haramand Plane: Three Translation Links (Pogus P21069-2). The three variants of the work were produced in 1993 and were originally released on What Next? Recordings. This is a reissue. For the record the three segments are called, respectively, "Chimanzii: Link (1)," "Chimanzii: Link (2)," and "Chimanzii: Drape: Link." My first impression of this three-part assemblage is that it might be the music a bee would put together if he or she were a bee-composer-artist. There is a number of motif samples sourced from strings that sound hive-like. Beyond that these are quite interesting soundscape structures that show a kind of organic continuity that have an almost orchestral quality. They are otherwise not easy to describe. They have various transformed oscillating trilling bee-buzzed tones more than noise-pitch constructions. It is quite unique and I cannot say I have heard anything quite like it all. The overall effect is mysterious and very musical, a series of related electro-acoustic tone poems if you like. Those with an avant sense of adventure will find it fascinating. It is easy to listen to and rewarding. That Hanns Eisler (1898-1962) ended up settling in East Berlin in his last years may in part explain why we in the West (in the U.S. anyway) have heard less of his music than we might have otherwise. That is, until recently. He like so many in Germany during the Nazi years chose to emigrate (and we know all too well now the talents of those composers who perished in the holocaust) and so was allowed to continue on with his music without fear for his life. Now that the world has aligned in different ways we can at last get access to more of his music. 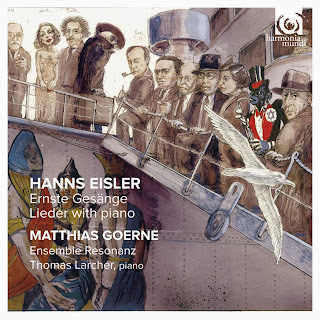 An especially fine release of his song output is to be had in the new CD Ernste Gesang, Lieder with Piano (Harmonia Mundi 902134), featuring the excellent baritone of Matthias Goerne, pianist Thomas Larcher, and the chamber group Ensemble Resonanz. These are performances that convince by their conviction and passion. 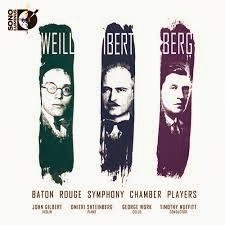 The "Ernste Gesang" includes the chamber group and has nearly all the bite and power of Berg at his finest, with a little of the R. Strauss of "Last Songs" as something reminiscent. The "Lieder with Piano" have great declamatory power and subtlety, of course in a more intimate setting. A bonus here is the presence of Eisler's "Piano Sonata, op. 1," a work that bolsters the case for his high merit as a key composer of the early modern period. Not all the lieder are modernist in the strict sense, but that matters little because the music is at a high level throughout, and Goerne soars beautifully through them all. There is nothing but praise for this effort inside of me this morning. Goerne has a Fischer-Dieskau burnished beauty to his voice, and in the more dramatic moments he is stirring indeed. Everyone comes through here. For the early modernist enthusiast it is a must-not-miss. Everybody should get a copy, even! 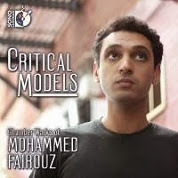 Mohammed Fairouz practices the art of modernism in music. The influence of his Middle Eastern heritage enters into it now and then, but primarily he writes in an international style and does so very well. This all can be heard to good advantage on a collection of chamber works entitled Critical Models (Sonus Luminus 92146), which came out a few years ago and I am only now coming to hear. Six varied works (some are multi-part suites) are represented on the disk. "Litany" for double bass and wind quartet, "Four Critical Models" for alto sax and violin, "Piano Miniatures," "Lamentation and Satire" for string quartet, "Three Novelettes" for piano and alto sax, and "Airs" for solo guitar. You are left, after hearing this recording the first or fifth time, with the feeling that you have heard an original voice. The performances by all concerned are excellent. If you (like I) missed this one when it first came out, try and hear it. Maestro Fairouz is a phenomenon. Recommended. Before the coming of Jimi Hendrix, The Jefferson Airplane, metal bands and those stacks of Marshalls, there was loud music to be heard. The military bands of the Ottoman Empire must have been quite noisy, though I don't know much about them; there were the monster concerts of Berlioz and of course Mahler's "Symphony of a Thousand," with hundreds of orchestral musicians and singers holding forth. All of these projected a good deal of sound, and still do when you hear them in their full setting. Still further, at least from the time of Bach on, there was the modern cathedral organ. Their full set of pipes and stops, and the cavernous space they were situated in, gave the various shades of fortissimos called for a huge impact. Instruments made from at least the 18th century on were even more capable of untrammeled power, as we can hear today. 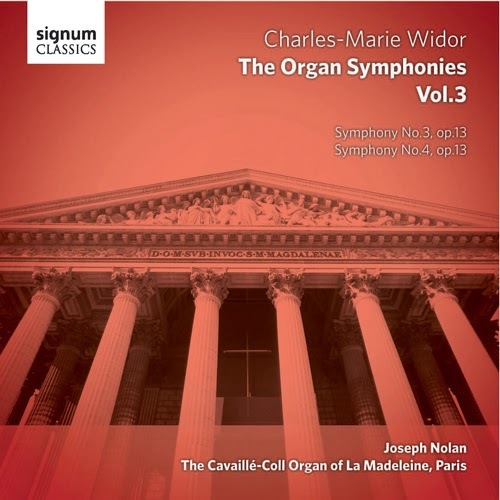 There may be no louder music (and softer for that matter) for such an organ than the Organ Symphonies of Charles-Marie Widor (1844-1937). He was one of the finest of the French Organ School, writing complexely dramatic, dynamic organ symphonies (ten in all) that excel in the structured long-form and provide both player and listener with much to explore, most all of it monumental in every sense of the term. Organist Joseph Nolan has taken up the gauntlet of recording all ten symphonies. His latest in the series, Volume 3 (Signum Classics 334) recorded on the beautifully Gothic 18th-Century Cavaille-Coll Organ of La Madeleine, Paris, includes Widor's Symphony No. 3 in E Minor, op. 13, and his Symphony No. 4 in F Minor, also part of op. 13, both published in 1872. They are sprawling works typical of the master, with both mysterious and grandly overpowering movements and everything in between. Joseph Nolan plays them with great elan and the sound of the CD triumphs from the passages that whisper to those that roar. This is music made for the CD--LPs always had a little trouble getting the dynamics together and if the recording was pressed masterfully, there was always the limitations of your cartridge to worry about. No longer! This digital record is exemplary in the huge range it projects onto your soundstage at home. The symphonies themselves, Joseph Nolan's performances, the organ and the recording all work together to triumph. Charles-Marie Widor would have approved! Here is one to get! In the pantheon of immortals up until recently there have been few women composers. Hildegard of Bingen seems to have been enshrined now. Then there is Clara Schumann (1819-1890). Wife of course of Robert, she was known as a pianist of first-rank. But she also composed some fine piano music, a great part in her younger years before domestic duties and eight children took her away from her music. What she left behind is something anyone who appreciates the period can revel in. For those who seek to experience her compositions first-hand there is an excellent new release devoted to them, sensitively and poetically played by pianist Eugenie Russo. The CD is entitled Clara Schumanns Klavier (Paladino Music PMR 028). It is a remarkable combination of a completely sympathetic artist and a marvelous instrument of the period, a Johann Baptist Streicher & Sohn grand, manufactured in Vienna in 1868 and played by Clara Schumann in January 1870 for the opening of the Small Hall of Vienna’s Musikverein. It is not as delicate sounding an instrument as you might have with pianos made earlier in the century. The upper range has a bit more projection and the lower one is nearly as robust as a good modern piano. But there is a definite sweetness to the sound that you don't hear from modern instruments. It complements Clara's music very well, matching her probing introspection with a sound that does not overpower. 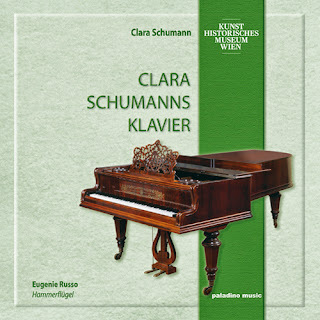 The program is an excellent assortment of Clara's works, from her Piano Sonata to some of the best of her intimate miniatures. Chromatic, expressive, this is romantic solo piano at its very best. I can think of no better way to hear it all than on a period instrument such as this, in the hands of Eugenie Russo. Enjoy this one without hesitation. Examples of "early" and "late (modern)" styles intermingling got off to a pretty auspicious start (in my own youthful listening days) with Stravinsky's "Monumentum pro Gesualdo" (1960), which featured a rearrangement of a Gesualdo madrigal. The album release at the time included fine examples of Gesualdo's vocal music along with the Stravinsky work. It gave us all something to think about, at least those who listened closely. Time has marched forward and of course composers like Arvo Paert have captured the enthusiasm of audiences over the world with an early-music-influenced modernity. A new release continues that trend with a well-conceived collection of Renaissance and early-music influenced modern acapella vocal works. New York Polyphony is the group behind it all, a four-man countertenor, tenor, baritone and bass confluence that performs the music with beauty, preciseness and a haunting expressivity. The album is called Times Go By Turns (BIS 2037). The works are well chosen. 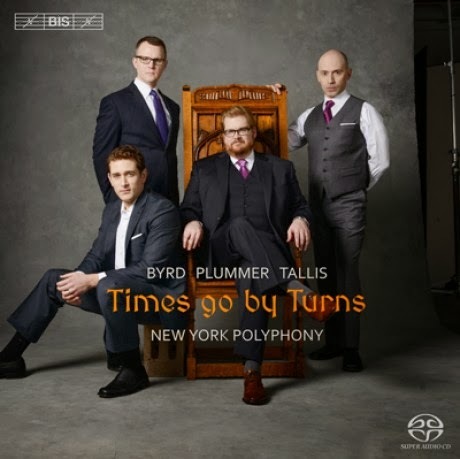 William Byrd's beautifully wrought "Mass for Four Voices" rubs shoulders with Thomas Tallis's four-voice mass and John Plummer's (1410-83) "Missa sine nomine." Aside from the wonderful performances, that would be somewhat unremarkable if it weren't for the interspersion of three parallel works from our era, Richard Rodney Bennett's "A Colloquy with God," Andrew Smith's "Kyrie" and Gabriel Jackson's "Ite missa est." The modern contributions are short works but nonetheless come as a refreshing breeze of the present, in an early style yet filled with the presence of the wider harmonic and/or rhythmic world we now mostly occupy, along with (in the case of the Smith work) an archaism that comes alive via the hindsight of the present. The end effect is rather magical. Hearing the early masses with a single singer for each part, the exotic timbre of countertenor (well represented in the person of Geoffrey Williams), and the lucid clarity of the contrapuntal mastercraft as performed in this manner bring you to a new awareness. Then the alternation with modern works increases the feeling that you are dwelling in unearthly musical worlds. It is a testament to the great talent and aural sublimity of New York Polyphony. It is music that grabs you from the beginning and does not let go until the last of it. It is a sonic adventure of the first rank. Recommended! 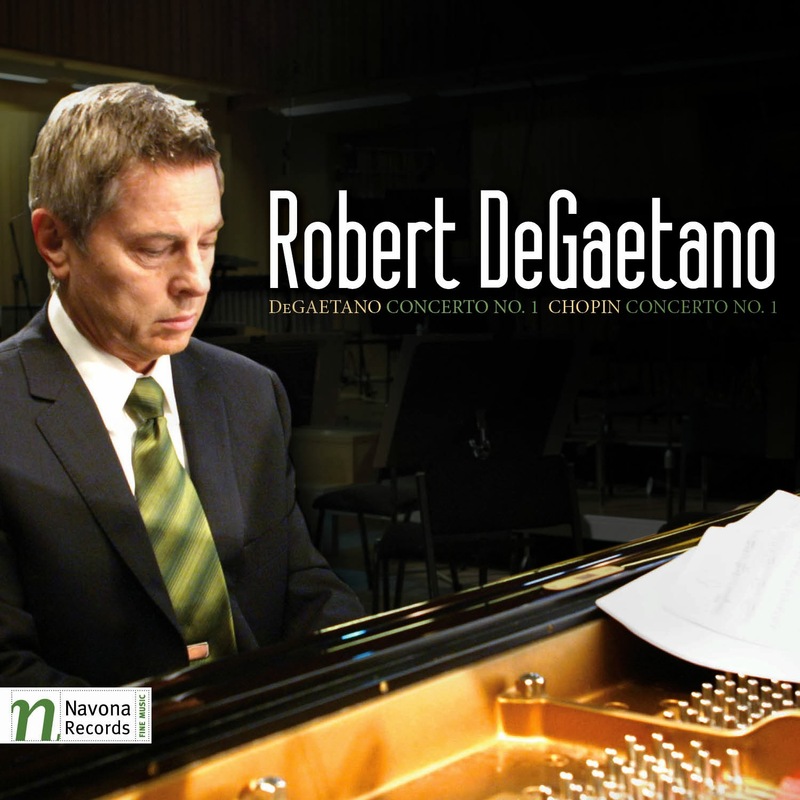 Robert DeGaetano is a world-class pianist and, as is clear on the recording of his revised Piano Concerto No. 1 (Navona 5929) (coupled with his performance of Chopin's Piano Concerto No. 1), a world-class composer. The story of the concerto is related on the accompanying DVD, "Journey of Passion." The first version was dedicated to his parents and performed to acclaim in 1989. But he was not fully satisfied with the results, so the score sat in his desk drawer until fairly recently, when he set about revising portions of it, rededicating it to the memory of his brother, who passed not long ago. The new version is given a rousing, sparkling performance on the disk by DeGaetano with the Moravian Philharmonic Orchestra under John Yaffee. The inclusion of Chopin's first concerto is fitting, since the DeGaetano work is a modern member of the classically romantic concertos in the line of Beethoven, Brahms, Chopin, Liszt, Rachmaninoff and then its further expansion into wider tonality by such artists as Prokofiev. That is only to say that the DeGaetano work uses the piano as a spectacularly virtuosic springboard for eloquent dialog with the orchestra and some extraordinarily dynamic, expressive, kinetically charged music. It's not that DeGaetano's work especially sounds like any of the forebears mentioned, but that the tradition, the evolved technique, the interplay is related to preceding composers as ancestors are to their progeny. The fourth movement "Danse exotique" is very rousing, nearly irresistible in its charm, and a very fitting capstone to a work of our time and yet timeless in its own way. DeGaetano and the orchestra are wondrously alive throughout. And the difficult solo part is handled with great elan. The Chopin First Concerto is given an excellent reading as well. DeGaetano brings out the singing mellifluousity of the solo part and the orchestra responds in kind. It's one of the very best versions I have heard. The 20-minute documentary DVD included with the release gives a good introduction to DeGaetano the composer, the pianist, the man with insightful narrative from the composer on his life and devotion to music, along with how he came to write and revise the concerto, and some glimpses into the session that put it all together for us to hear. This is a release anyone with a love of the piano concerto in general will find a major addition to their collection, for DeGaetano's artistry with both his and Chopin's works. Those who follow contemporary music will surely want to hear the DeGaetano opus. And in general it's fine music, well performed, music of the sort that should appeal to anyone with a serious interest. I've found that high modernist abstractions and the pianoforte go especially well together. Perhaps it has something to do with my appreciation of how hard the music can be to play properly on that instrument. Needless to say it requires musicianship and an understanding of the thrust of the work that goes far beyond "Chopsticks!" Partly for that reason I really appreciate the performances on Robert Carl's collection of works for the piano entitled Shake the Tree (Innova 857). 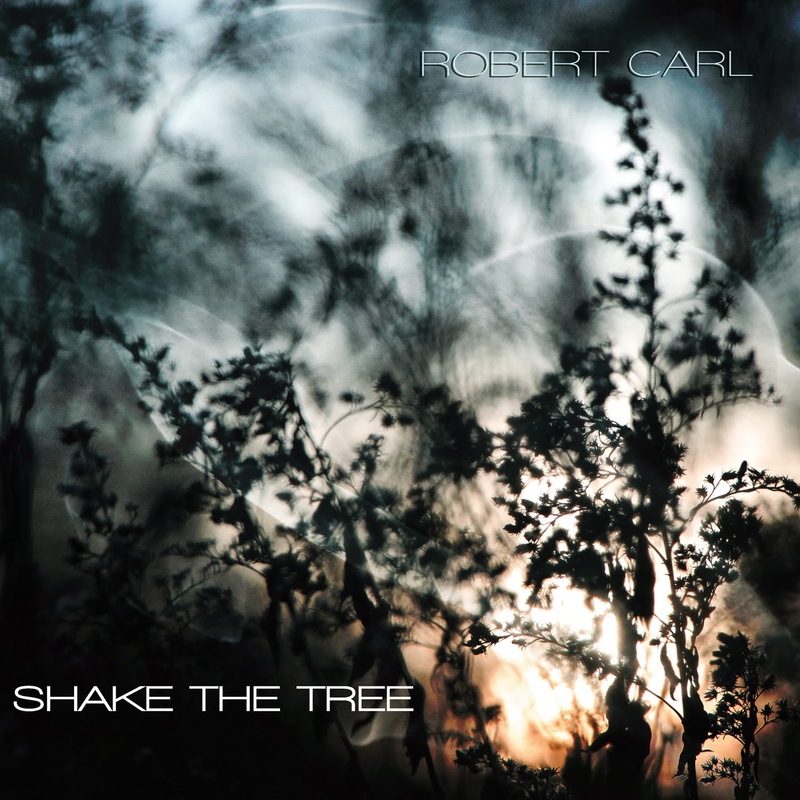 The disk features three Carl works: "Shake the Tree" (2005) for piano four-hands, "Braided Bagatelles" (2001-2) and "Piano Sonata No. 1 'The Big Room'" (1993-99), the latter two for solo piano. Pianists involved are Donald Berman and John McDonald for the four-handed work, then Moritz Eggert and Erberk Eryilmaz for the succeeding works, respectively. All four artists give the Robert Carl compositions a lively realization. The works themselves have the expansive chromaticism and pan-tonality of the contemporary and a kind of discursive logic that has an almost narrative quality. They have a complexity that takes them into the realms of the advanced yet somehow all seems clear and readily comprehensible to the attentive listener. There is little of the sort of open, continuous pointilism of a Boulez. The abstract phrasings speak in varied ways, interconnecting. Carl, born in 1954, studied with Rochberg, Xenakis and Ralph Shapey, and some of that comes through, along with the sort of Ives-Ruggles open-to-the-new, try-anything freshness that characterizes the American avant garde at its best. Robert Carl has an affinity for the piano. That is clear. His compositions come across as highly invigorating, smart, devoid of mannerism or cliche. They are well-realized by the pianists involved. It is a treat to hear it all. Recommended.